wdnicolson.com - An NRL Blog: Pretty Brown... and Browner Still. From the Martin-Molloy Audio Archives. Pretty Brown... and Browner Still. From the Martin-Molloy Audio Archives. Back in the 1990s - (yes current teenagers they did exist) a radio show called Martin-Molloy was THE show to listen to on the radio (yes radios did actually serve a purpose back then too). Hosted by Tony Martin & Mick Molloy, they did the drive time shift on 2Day FM in Sydney/FoxFM in Melbourne/etc and entertained almost everyone across Australia from 1995-1998. They were comedy gold to such an extent that you'd endure the best of the Spice Girls, Hanson, Aqua and (the unforgettable) Ace of Base every 10 minutes - because they were that good. At the end of their first year as a duo in 1995 - they released 'The Brown Album' a collection of their best work to date. When you consider they had been on air for less than a year - their work had to be brilliant for a music executive like Michael Gudinski from Mushroom Records to package it up as a highly successful CD release for Christmas 1995. But it wasn't just classic comedy on the CD that is memorable. Their entire show was pure genius. When Tony Martin & Mick Molloy launched the album in late 1995 - the James Bond film GoldenEye (the debut as Bond by Pierce Brosnan) was also coming out and in a memorable segment called 'The Brown Event' - they used a very simple formula to produce memorable radio and plug their new product. For your listening pleasure - here is 'The Brown Event' from late 1995 in .mp3 format. 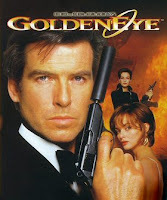 My favourite is surely 'The Man with the Golden Brown'... but as Martin points out - reworking the current release of GoldenEye with the word brown... is well 'more tasteful'. Sherlock Holmes Review... Adventure is back! 2010 is here... and we'll be covering it.